Space is limited. Please RSVP using the link to the right. Carey Lin, co-founder and director of Stairwell's, and Gabriel Gilder, composer and musician. Keys to the City is an interactive artist-led walking tour in San Francisco’s Civic Center neighborhood that explores our evolving city and the unique connection found between baseball and stairs. Planned in conjunction with the current SFAC Galleries City Hall exhibition Fantasy Life  by Tabitha Soren, the Field Trip examines the built environment for evidence of adaptation to change and instances of 'hyperart'--defunct yet curiously maintained relics hiding in plain sight. This 2-hour evening excursion includes indoor and outdoor stops, with games, facts, figures, and thematic snacks along the way. 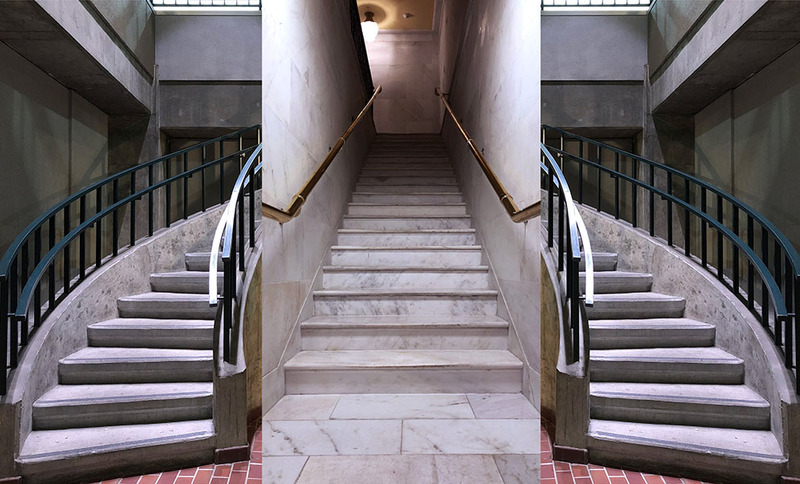 Participants will survey a wide range of stair specimens, create shadow portraits, and speculate together on architectural mysteries. This event may include a lot of walking. Please wear comfortable and sturdy shoes.